ipadyoupad | If I can figure this out, so can you. So Apple made their big reveal earlier this week regarding their new iOS and where they will be focusing their energy. I was particularly intrigued to hear about their new Swift Playgrounds, an iPad app to learn Apple’s programming language. and had to share IMMEDIATELY. The best part is, these tools are now cross-platform! You can use your iPad or your laptop! I have downloaded all three and plan to try them in the next week. Stay tuned! Paper circuits was by far the most popular activity of the month. Indeed, it was so popular I still am getting students asking me if they can make a card! Make sure to not rip the tape, which is finicky. TIP: take the backing off gradually as you go. Also make sure the tape is as smooth as possible and the LEDS are properly glued to both tracks. If it doesn’t seem to work at first, try flipping the batter over. Not sure why this is. It feels a little like magic. There were some happy mothers on Mother’s day! Paper circuits was a great introduction to the concept of Makerspace. It combines a simple technology that the girls can simply copy or take farther (circuits) with the fun of crafts to produce a magical result. The girls were thrilled with their cards and want to do more. Our lunchtime forays into Littlebits did not, alas, gender a whole lot of enthusiasm among the students. The teachers however, had a great time! Here is a link to a five second video that gives you an idea of how annoying the buzzer is. It’s true that Littlebits are geared towards more of a younger crowd, but as you can see from the video above, there are some pretty sophisticated things you can do with it. Week 2 of the Makerspace launch was aided and abetted by Mr. Scruton, who helped us make pianos out of cafeteria fruits and vegetables, take selfies by pressing down a sensor (sort of like the cat in the video) as well as playing Pacman using celery as a joystick and fist-bump pausing videos. This was by far one of the most popular activity. The students were fascinated by how they could conduct energy through an orange or a pickle. Heck, I’m fascinated by this. The students were the ones to ask how the cat could take a selfie and wanted to figure it out. I found that at first, you have to let the students play with something that is already set up. Once they get over the fear of “breaking it”, they are then in a better place to try new things out. This starts slow- at first they simply change the type of vegetable. Or, in the case of the Pacman video game, start to move the wires when they find that they can’t move left for some reason. But then, all of a sudden, the what-ifs start to externalize: What if we used this instead of this? What happens when…? Although we don’t have a whole lot of time at lunch and the process could be taken much further, it was gratifying to see how students quickly get over their internal barriers to play and begin to lean in to their curiosity. 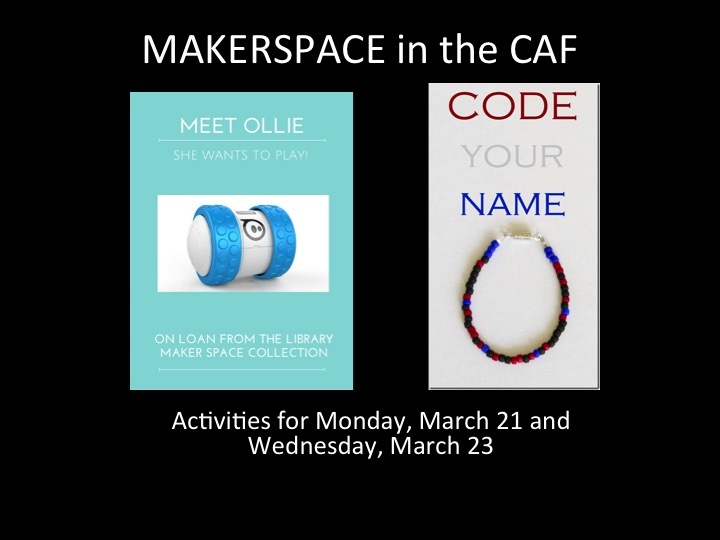 In order to promote the Library Makerspace materials, the Makerspace team have been setting up shop in the cafeteria at lunch for the last few weeks. Our first week was March 21st. This was by far one of the more popular activities. It was a great, subversive introduction to computational thinking disguised as an easy craft. 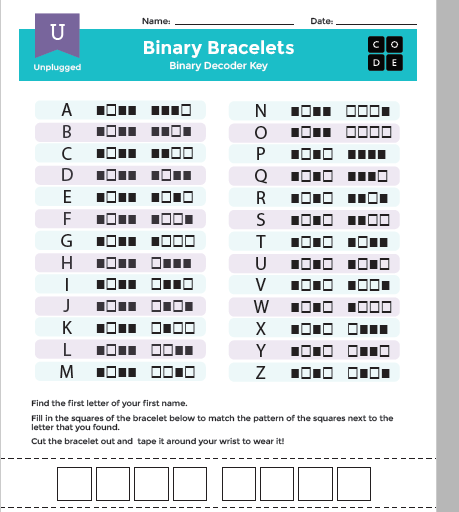 Although most of the students stuck to the challenge of writing their names in binary, a few opted to simply make a bracelet or a necklace, which was okay too. The whole idea is to introduce some hands-on exploration in their day that has no external pressure attached to it (grades, competition, etc.) Also, the kind of repetitive, detailed task of beading is almost like meditation, so there is a nice mindfulness component to this activity as well! I took charge of our resident robot Ollie. I had a hard time finding people who wanted to drive it at first, but after driving it around the cafeteria for a few minutes and bumping into people, I finally got some takers. I was hoping they would try to program his movements in Tickle, but I found that I had to prod the students to even take the controls. They were so afraid of “breaking it” or of “making a mistake” they wouldn’t even try at first. It was a real lesson for me in terms of the internal barriers to discovery and exploration that have already begun to take root in our young girls. yet, with a little bit of prodding and basically shoving my iPad into their hands, by the end of lunchtime I couldn’t take it away from them.